This is a non-fiction work of a highly controversial nature, though not sensationalist. The content is researched and written by a credentialed biblical scholar, the arguments presented are based on historical facts, archeological discoveries, ancient texts and iconography. The Final Deception explains no evidence exists of a Hebrew or Israelite presence in ancient Egypt because the Old Testament is the history of the Hyksos people, who traveled west from Sumer and co-opted the Hebrew identity and named themselves "Israel." The Hyksos was known as "shepherds" and all the central characters of the Bible are "shepherds," a title that has nothing to do with a caretaker lovingly caring for those in need, as in the stylized interpretation, but rather is strictly administrative and hierarchical. 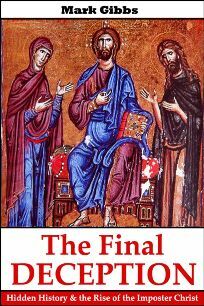 The "Christ" tradition was lifted from the "Magi" people and the Christ identity was transposed onto Jesus of Galilee, who was not the Christ, but had a specific agenda, which is explained in the book. Events are traced back to Sumer and the influence of Annunaki deities, which Sumerian texts explain in great detail. The Annunaki agenda is rewritten in Christian doctrine as "regeneration" or "rebirth", ideas that are drastically in need of re-assessment. The book closes with an examination of the Cathars and the story of the Montsegur, and suggests that hope is not yet lost.